Although the Intel NUC Skull Canyon (NUC6i7KYK) is officially compatible with Windows 7 (64-bit), you will soon realize that its installation will not be so simple. Indeed, the Intel NUC Skull Canyon has only USB 3.0 ports and since Windows 7 does not natively support USB 3.0, installation will be impossible from the original DVD of Windows 7. Then, you should also know that the Intel NUC Skull Canyon supports SSD in M.2 format, but also NVMe SSDs. If you are using a M.2 SSD, it will be recognized by the Windows 7 installation wizard. But if you choose an NVMe SSD, the Windows 7 installation wizard will not detect it. You will not be able to install Windows 7 without the following solution. To resolve these two issues, you will need to add Intel's USB 3.0 drivers and NVMe support to the Windows 7 (64-bit) DVD. IMPORTANT : on the Intel website, this mini PC is officially compatible with the 64-bit version of Windows 7, 8.1, 10 and Server 2012. But after trying to install the Windows 7 x64 drivers of this mini-PC, the Bluetooth driver provided by Intel asked us to first install the SP1 of Windows 7. Info : Intel is providing a "Windows 7 USB 3.0 Creator Utility" program that is supposed to solve the problem of USB 3.0 drivers for installing Windows 7 on this mini-PC, but when the Windows installation wizard will ask you for a name for your PC (ie after the 1st restart of the mini-PC), the keyboard will no longer be recognized. So, you must follow our tutorial to be able to install completely Windows 7 x64 on this mini PC. the Windows 7 USB 3.0 Creator Utility program from Intel (because it contains the USB 3.0 drivers that we need). 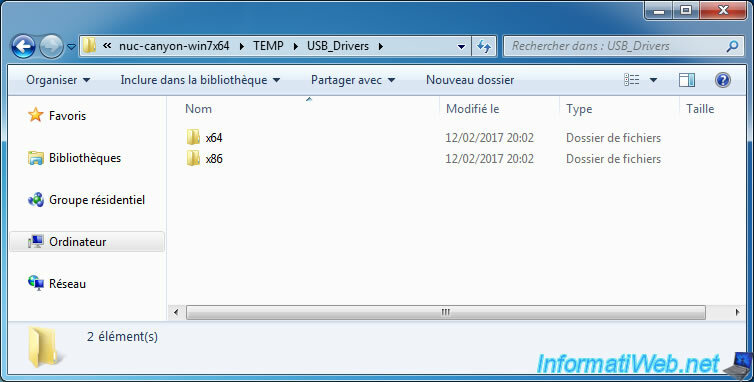 You must download the Windows 7-USB3.0-Creator-V3-Win7Admin.zip file from Intel. the DISM GUI program (allowing you to add drivers and updates in the Windows 7 iso). Click here for the direct download link. the Microsoft .NET Framework 4 to be able to run DISM GUI. 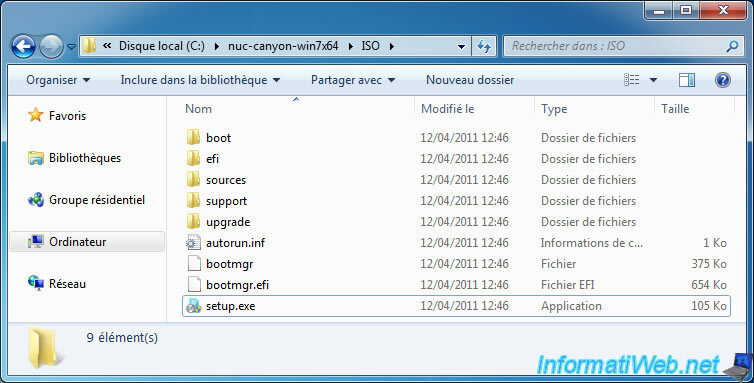 For this tutorial, we will create these folders in a folder "nuc-canyon-win7x64". First, extract the contents of the Windows 7-USB3.0-Creator-V3-Win7Admin.zip file in the "Temp" folder. In this folder, you will find an "USB_Drivers" subfolder. Since this mini PC is only compatible with the 64-bit version of Windows 7, we will use only the x64 version of these USB 3.0 drivers. In the x64 subfolder, you will find 8 files, including .sys files (drivers) and .inf files (configuration files for installing these drivers). 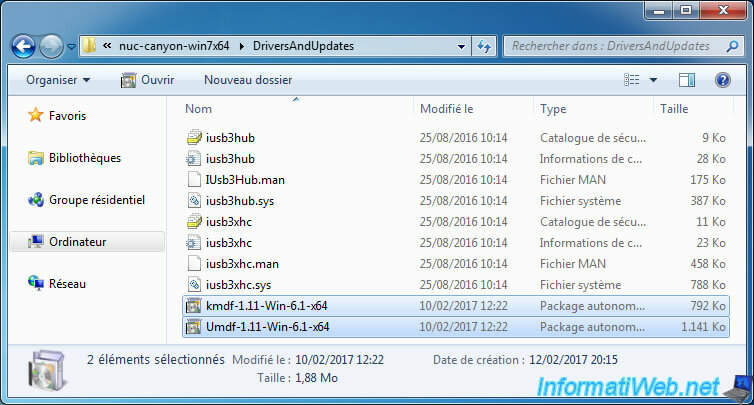 Copy these 8 files to your "DriversAndUpdates" folder. For .msu files, there is nothing to do. 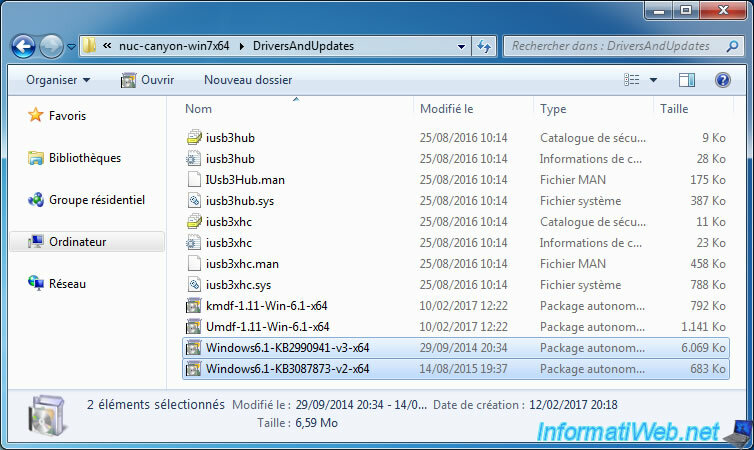 Simply copy the 2 files to the "DriversAndUpdates" folder. click the "..." button to select your "DriversAndUpdates" folder. Finally, you should have 2 additional .msu files. If you have a Windows 7 x64 physical DVD, then copy its contents to your "ISO" folder. Finally, you will get this.